If you follow me on Instagram, you may have seen this already, and yes I'm reusing my Instagram post for an outfit post... What of it!? It's just because I forgot to take proper photos last night. Oops! I wore this gorgeous iris print jacket from Miss S for the first time yesterday, and I've fallen for it so hard! It's so easy to wear and to glam up the simplest outfit! I'm really feeling the blues in my wardrobe at the moment and have bought a lot of blue this season. But this jacket is just something else...! The print is just perfect. I'm sure you'll see this featuring again on here soon! 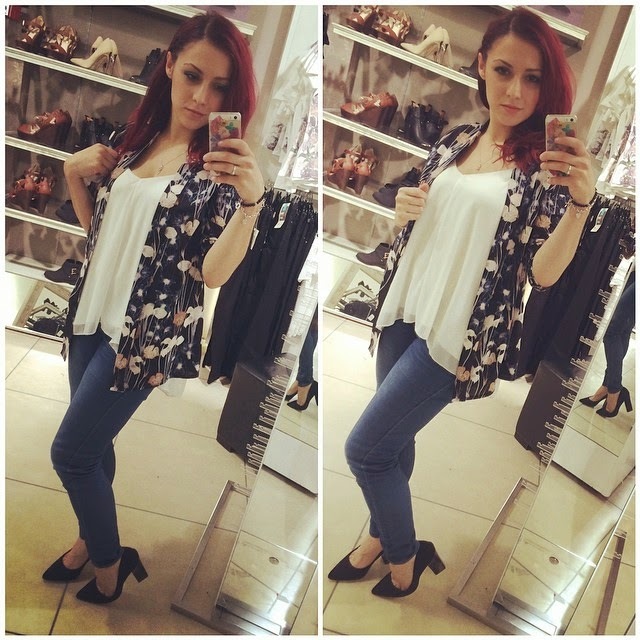 I wore it with my simple embellished strap cami top, and a pair of trusty Primark jeans. I forgot how much I love these jeans. As for the shoes - I borrowed them for the post.